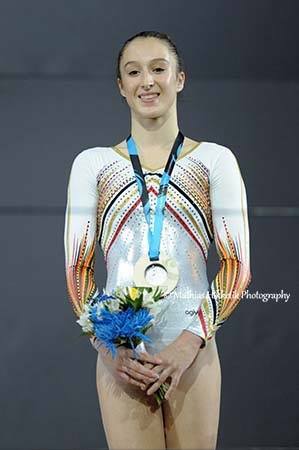 Belgian Gymnastics: 2017 Worlds: Nina Derwael wins a historical bronze medal on uneven bars! 2017 Worlds: Nina Derwael wins a historical bronze medal on uneven bars! After an amazing performance in the all-around final along with Rune Hermans, Nina Derwael did even better in the uneven bars final, winning a historical bronze medal ! Nina successfully qualified for the final with the 4th best scores out of the 8 gymnasts that made it, posting 14.966. But she knew she had to step up her game if she wanted to medal. Which she did. She was the second gymnast to go on Saturday, and with the best routine she's ever performed, she managed to score 15.033, earning the best score of her career under the new code of points ! All she had to do now was to wait anxiously. Only two gymnasts surpassed her : the reigning World Champion, China's Fan Yilin (15.166), and European silver medalist Elena Eremina (Russia, 15.100), leaving Nina Derwael with a historical bronze medal around her neck. What Nina achieved in Montreal is an amazing accomplishment. After being the first female gymnast to ever qualify to an apparatus final, she got Belgium's highest ranking in the all-around competition with an 8th place finish. Her bronze medal, the first for a female gymnast at Worlds, ends 104 years of shortage, the last medal being won in 1913 by Pierre Hentges on parallel bars, in a time where only 5 countries were competing at Worlds. After returning home on Monday, Nina will now enjoy a little of fame and will get back to work, with Glasgow and the European Championships in sight.